Cute & Fluffy Video Slot Guide & Review - Casino Answers! Cute and Fluffy is a 5-reel, 25-line video slot developed by Playtech, featuring stacked wilds, scatter wins, multipliers, a free spins feature and a gamble feature. You can play the Cute and Fluffy video slot at Bovada. Coin values on the Cute and Fluffy slot machine are $0.01, $0.05, $0.10 and $0.25. You can select between 1-25 paylines per spin at 1-10 coins per line. The lowest total bet you can make on the Cute and Fluffy slot game is a penny per spin up to the highest total bet of $62.50 per spin. 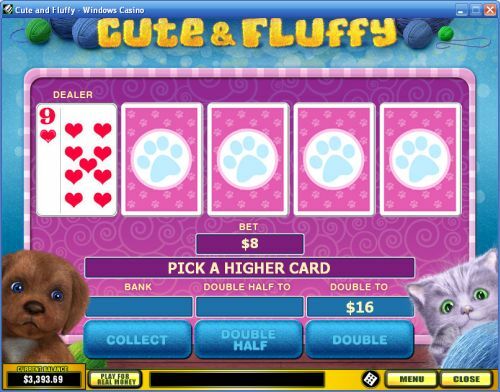 Cute and Fluffy has a good betting range that should suit both low and high stakes slots players. You can up to 99 autoplay spins. You can manually skill stop the reels at any time by hitting the “Stop” button in the middle of any spin you make. To play the Cute and Fluffy online slot game, select your bet and hit the “Spin” button or press the “Bet Max” button to play with all 25 lines at 10 coins per line. The highest paying symbol on the Cute and Fluffy slot game is the Puppy symbol. If 5 Puppy symbols appear on a selected payline, you will win the 10,000 coin top jackpot. The Puppy symbol is wild and stacked on all reels. It will substitute for all symbols except for the scatter and bonus symbols. The Dog Food symbol is the second highest paying symbol on Cute and Fluffy, offering a payout of up to 1000 coins. Cute and Fluffy’s scatter symbol is the Kitten symbol. 3, 4 or 5 Kitten symbols anywhere on the reels will pay out 10X, 50X or 500X your total bet. A 500X scatter win is one of the huge wins you can get from the Cute and Fluffy video slot at Bovada! If you are able to collect 4 Dog Bone bonus symbols on a reel, you will win 4X your total bet, plus 5 free spins with a 2X multiplier. Anytime a Bone symbol appears on a reel, it will drop to a plate below the reels. If you collect 4 Bones on a plate, the free spins feature will trigger. The number of Bones in plates will remain the same if you exit and re-enter the game. Bones collection is per total bet. Plates are filled separately for every total bet played. When returing to a previously used total bet, the plate states are restored. Bones appearing during the free spins feature will automatically add an additional 5 free spins to the feature without dropping a Bone in the respective plate. Only the highest win pays per payline. Winning combinations pay left to right only, except for the Scattered Kitten symbol (which pays any). Payline wins are multiplied by the bet per line. Cute and Fluffy is the most adorable slot we have come across to date. 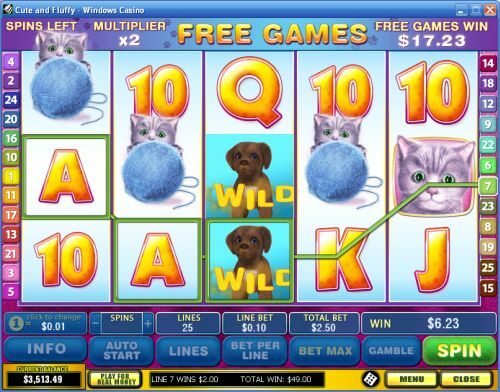 Animal lovers, whether they prefer cats or dogs, will love playing the Cute and Fluffy video slot. Aside from the five-star presentation, Cute and Fluffy’s free spins feature is excellent. It also has a high top payout of 10,000X, so it has more than just cuteness. You can play Cute and Fluffy when you sign up and make a deposit at Bovada! Can USA players play the Cute & Fluffy online slot for real money? American players are out of luck when it comes to playing the Cute & Fluffy video slot for real money at Playtech online casinos. For those still looking for a dog-themed video slot to play, please read our Dog Pound Video Slot Review or play it at Bovada. For the cat lovers out there, you can read our Operation MYOW Classic Slot Review and play it at Bovada.